There’s cuteness overload as the fluffy little bundles of fleecy fun arrive on Junior Farm and you can learn more about them and help the dedicated team to bottle-feed the hungry lambs at 11am, 1.30pm and 3.30pm and NEW for 2019 Lambing Live offers the chance for you to see the lambs being born. There’s a full timetable of hands-on activities all day that also includes guinea pig cuddling, pony grooming and watch the piggery feed. 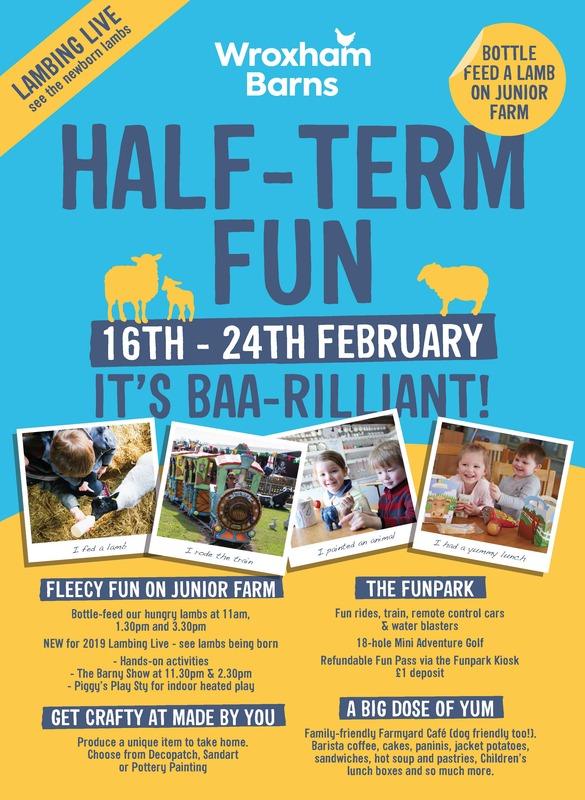 Don’t miss The Barny Show daily at 11.30am and 2.30 pm as our Junior Farm mascot hosts “woolly” lamb fun with singing and dancing in Bella’s Barn too. The Family Funpark will be open with rides, a trip on the Wroxham Barns train, remote control cars and boats, water blasters and our 18-hole Championship Mini Adventure Golf Course to take on the family and see who’s the champion putter. Get your Refundable Fun Pass at the kiosk with a £1 deposit and add as many credits as you’d like. (Register and keep your card for a 20% bonus on all future top-ups). When you’re ready for a pitstop or a light lunch, the Farmyard Cafe is the place to be. Plenty of seating both inside and on the outdoor Terrace. Barista coffee, cakes, jacket potatoes, sandwiches, hot soup and pastries plus so much more. *The Farmyard Cafe discount must be used on the day of your visit. Please note, under 2’s and Season Ticket Holders are FREE.